Happy Thanksgiving! In honor of this holiday dedicated to thankfulness, I would like to offer a book recommendation. For those of you who don’t know me well, I am a certified bookworm. I’ve been known to sit and read for hours at a time, or maybe even finish an entire book in one day. My favorite books are non-fiction – true accounts of grace and triumph. Those are the stories that stay with me the longest. 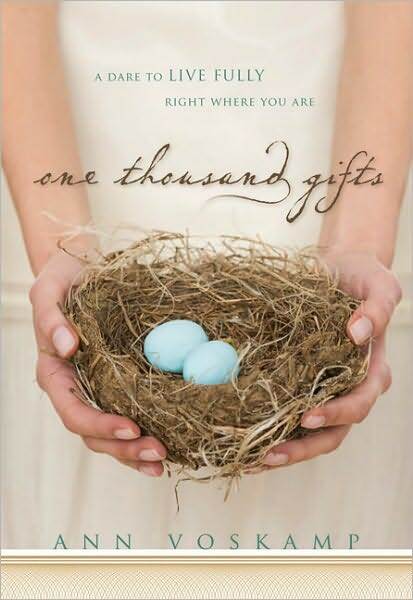 I started Ann Voskamp’s book One Thousand Gifts this summer in June and finished it in August. Two months is a long time for me to complete a book, especially one I like. But this was a book I had to read slowly. I have to tell you up front that Voskamp’s writing style is quite unique. The entire book feels lyrical, almost like reading poetry. It is beautiful, no doubt, but you have to be committed to finishing because at times it’s not easy reading. However, it is so worth it. 1. Morning shadows across the old floors. 2. Jam piled high on toast. 3. Cry of blue jay from high in the spruce. What started with a journal leads Voskamp into full-blown research on gratitude. 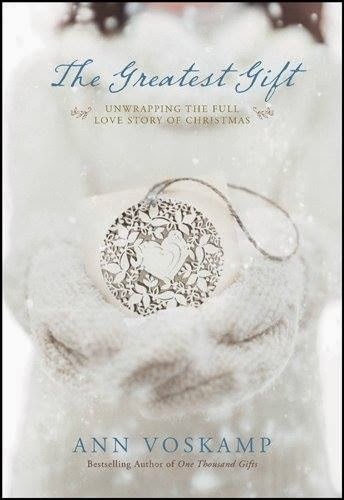 She explores the theme of thanksgiving in the Bible and studies the way Jesus modeled gratitude throughout his life. She begins to witness the profound effect that intentional thankfulness has on her own well-being, while simultaneously discovering how her gratitude affects the people around her, primarily her family. I found it fascinating. When I think of the impact this book had on me, the two words that come to mind are practice and noticing. It may seem strange to think that it takes practice to be thankful, but for me sometimes it does. I’m not talking about when things are great. I have no problem being thankful during life’s major ups – a wedding, a new baby, holidays spent with family, special gatherings with friends. Those are the times when gratitude comes naturally. But what about in the every-day moments of life? What about when you’re cruising down the same aisle in the grocery story for the fourth time because you can’t find what you need? What about when your toddler son is pitching an ugly fit in public? What about when you get an unexpected bill? What about when your co-worker gets credit for something you put together? What is the role of gratitude then? During the normal, mundane, sometimes annoying or inconvenient moments of life, I do believe having an attitude of gratitude takes discipline… and practice. Maybe it’s my background as an athlete, but I was exceptionally encouraged by the idea that I can practice living my life from a place of gratitude. I know what it’s like to practice – sometimes you rock it and sometimes you bomb, but every attempt makes you better and better. Practice isn’t an all or nothing moment – it’s a process. Ever since reading One Thousand Gifts, I’ve been practicing living a grateful life. I don’t always succeed, but I think I’m making progress. And the more I practice, the more natural and easy it becomes. 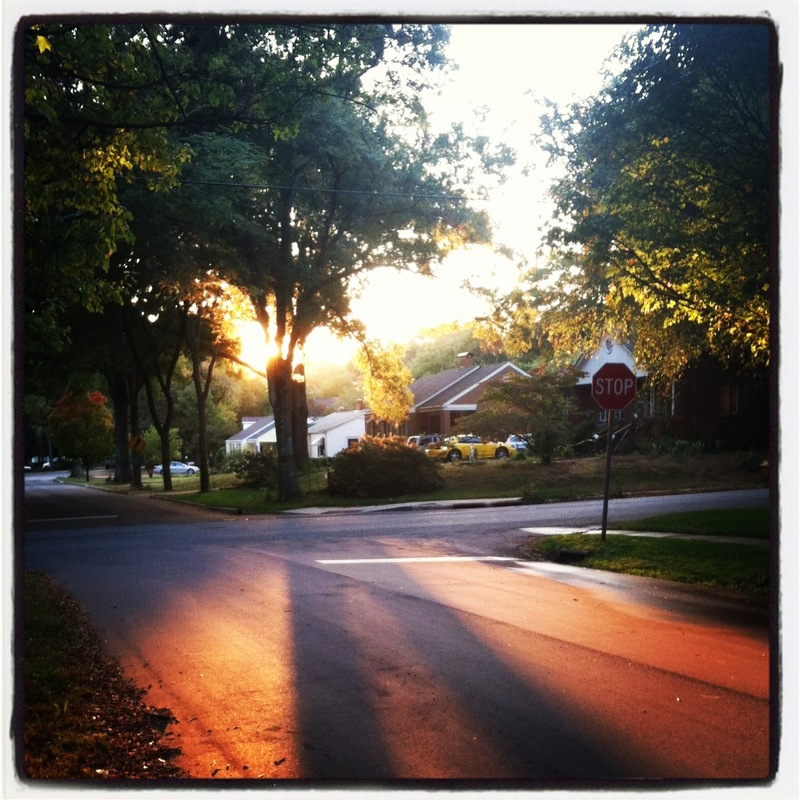 Noticing is the other key Voskamp found to living a life of thankfulness. It’s what her gratitude journal was all about – taking the time to notice life’s gifts. As I’ve followed suit and tried to practice gratitude, noticing has been crucial for me as well. When I feel myself getting frustrated or bothered, it helps to slow down and notice the gifts and the beauty already around me. Today is the only day of the year dedicated completely to gratitude. It’s my favorite holiday for that reason… well, and for the food and football too! If you’re interested in keeping an attitude of gratitude on the other 364 days of the year as well, I recommend reading One Thousand Gifts for inspiration. I don’t think you’ll be disappointed. I hope your Thanksgiving is filled with lots of love, joy, and relaxation!